Hey! A day late on this one, my internet was down yesterday after work. Boo. I'll keep this post short seeing as I have to be to work in a few minutes. The bottle I'm holding is Cirque Planet Caravan. I have always felt that purples are cool colors, because it's a secondary color of blue and red, it could really go either way. So to make it more cool I've added Essie Dive Bar gradient. Now there is no doubt it's cool. Also a little sticker. Because it needed something!! I'll have some super great swatches soon of some super great polishes I just picked up. Stay tuned! Those colors look so cute together. That's so pretty. gorgeous polish! i went with a purple too! 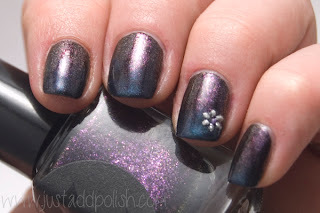 love colours in the gradient, cute flower for sure! beautiful gradient! and i love that little flower!